Saudi Arabian-based manufacturer offers food-safe paper packaging. Multipak Ltd. has attained Hazard Analysis and Critical Point (HACCP) certification as of 1 June 2007. 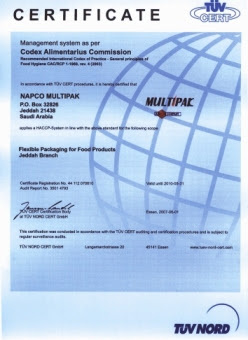 Certifying body TUV NORD CERT GmbH confirms Multipak’s management system, as per the Codex Alimentarius Commission. The HACCP management system requires suppliers in the food chain, including packaging manufacturers, to analyze and control biological, chemical and physical hazards. Multipak produces paper packaging for food products, including satchel bags, SOS bags and paper sandwich wrap sheets for international and regional fast food franchises, restaurants, bakeries and other food establishments. Thirty per cent (30%) of the producer’s packaging products are destined for export markets, including Belgium, France, and Switzerland. Multipak’s HACCP certification is valid through 31 May 2010. Multipak Ltd., established in 1997, has become a leading Middle Eastern supplier of specialty paper bags (handle bags, self-opening sack SOS bags and satchel bags), paper rolls, paper sheets, gift wrap, and paper core. Competitive with Western imports, Multipak’s paper products range from commercial to high-quality grades. All products may be coated with select materials and may be printed in up to 6 colors. Multipak targets the Saudi Arabian, GCC, and North African markets. The paper converter is a member of Napco Group and INDEVCO Group.